Helical Piles are steel shafts with a series of low-pitched circular steel helical plates welded at strategic positions along the shaft. The plates give the foundation both tension and compression bearing capacity which enables them to be used for a wide range of applications across many industries and sectors. The piles can be connected in groups using a steel load transfer grillage and are screwed directly into the ground by machine-mounted hydraulic or electrically powered drilling equipment. Helical Piles make the use of concrete for foundations a thing of the past. Helical Piles are relatively inexpensive because they are very quick to install. They are specifically designed to suit the ground conditions and the application requirements and come in various lengths and thicknesses. The helical pile is a versatile, environmentally friendly and cost-effective technology with many uses across civil engineering industries such as buildings, transport and communications. Where Can Helical Piles Be Installed? 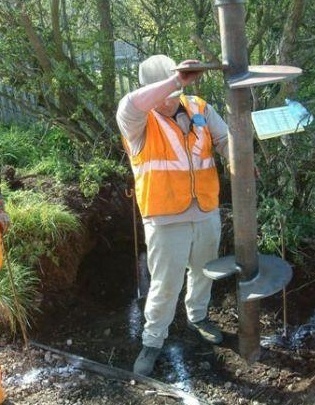 Our engineers design helical piles to suit the ground conditions at every individual site. This technology is one of the fastest foundation solutions in existence and this, combined with reduced environmental impact and ease of installation in restricted access sites, is the reason that this technology is so popular and so widely used today.